Why Wont My Quotes Send Via Email? How to take card payments for a prepaid taxi ? If you go to settings >>> Take Card Payments >>> click connect with stripe. A form will open in a new window to create an account with Stripe, fill out the form and then you should be ready to take payment. 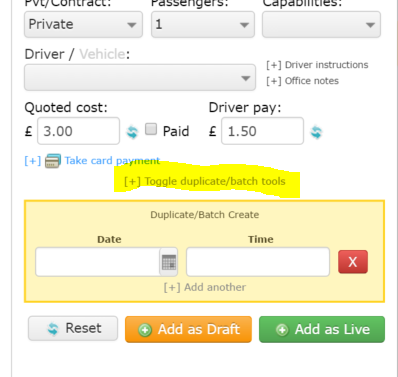 If you have self employed drivers you can create different accounts for each driver so as to keep you company below VAT etc. That is all explained on the Take Card Payment page. Are you able to add a recurring job on to the system? On the driver app is there a way you can have it so if i was to have a hailed ride instead of having to input the pick up address and drop off address it knows already and also works out the price? In Settings >>> Miscellaneous >>> You can set for the system to use google places or Historical Jobs. Set that to Google Places and that will pre-populate the pickup location. Once there is a tariff set it will price the job for you. 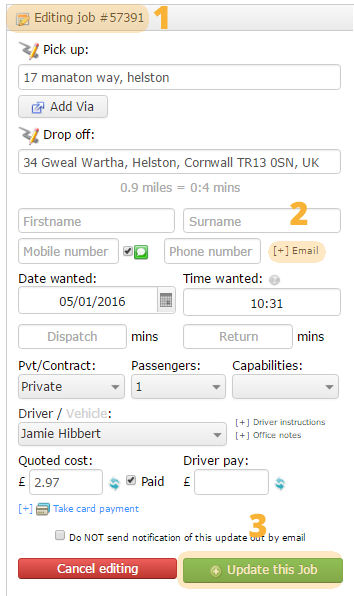 Can I hide quoted costs/prices from drivers? Some companies do not want the drivers to be able to see the price for jobs. We have created the ability for you to switch this functionality off if required (default is on). 1. Are the drivers’ phones plugged into a power source? If phones go low on power location services are usually some of the first to drop out. 2. If the app has been open for a long time it could be that the phone’s geolocation services have gone to sleep. Quitting (and we mean quitting) the app and re-opening might wake geolocation services up. 3. The phone might not allow geolocation services for the app (turn on via phone settings). 4. Does the map in the app show the correct or incorrect location for a driver? If the map in the app is showing correct location, but the app is not pinging it back to base, please report it to us. 5. Does a driver’s location update/correct itself if they start a job? There’s enhanced driver tracking when a driver is on a job so this should plot the driver correctly all the time.